Recall that in Islam, Jesus is considered a prophet and holy man. 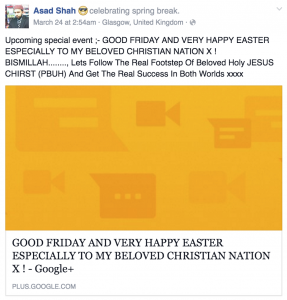 Shah was saying nothing in this post that falls into blasphemy in any way. Asad was killed by a Sunni Muslim, currently in custody, who stabbed him 30 times and stomped on his head as he lay on the ground dying or already dead. Mr. Shah was an Ahmadi Muslim (part of the Ahmadiyya Muslim Community), descending from a movement in the 19th century from the teachings of Mirza Ghulam Ahmad, who claimed to have been sent to fulfill end times prophecy in a peaceful manner. The Ahmadi are often victims of violence in Pakistan, where the movement originated in Punjab. Though the Christian movement began in Judaea (modern Israel) following the life of Yeshua ben Yosef (Jesus), it grew westward rapidly and is today seen by many as a “Western” religion. Radical Islamists, long targeting their own in terror attacks, now do so if any sense of brotherhood or compassion is expressed toward those of other faiths – especially Christians.